Apparently, Disney was prepared for anything that could possible happen to its trio of iconic stars as they set out to relaunch the very lucrative Star Wars franchise. And as fans saw, anything could happen, as Harrison Ford was involved in a very serious on-set injury that ended with him in a leg cast. And shortly after filming wrapped on last year's The Force Awakens, he was involved in a serious one-man airplane crash that he ended up walking away from. This past week, Harrison Ford's long-time co-star Carrie Fisher passed away following a heart attack. Her untimely death came after Star Wars 8 had wrapped. 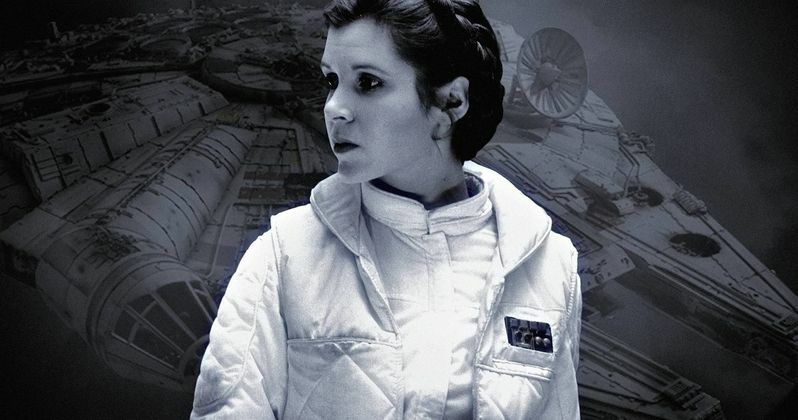 But with Star Wars 9 still on the horizon, which was originally planned to include Fisher, her death has reportedly prompted one of the biggest personal accident insurance claims by a studio in history. ItstheVibe.com are reporting that Disney will receive up to $50 million in their insurance payout for Carrie Fisher, who died this past Tuesday. Disney took out the insurance claim in case Fisher was not able to fulfill her three-film contract. Lloyds of London is said to pay out for the "contract protection cover", with the insurance underwritten by US-based Exceptional Risk Advisors. They claim they're "experts in insuring complex human capital risks for highly successful individuals". Slated for release in December of 2017, Disney and Lucasfilm had already wrapped production on Star Wars 8, though it is believed that reshoots will happen sometime early in the new year. Carrie Fisher had finished her portion of the shoot, and it has not been stated whether or not she was needed for the upcoming reshoots. She is expected to have a bigger role in Star Wars 8 than she did in Star Wars: The Force Awakens. And this latest report claims that the role of General Leia Organa was to have expanded even more heading into Star Wars 9, which is scheduled to hit theaters in 2019. While the story in Star Wars 8 won't change much, it is believed that the entire script for Star Wars 9 is having to be reworked. None of this have been confirmed with anyone directly involved in the making of the movie. The next Star Wars movie will be Carrie Fisher's final big screen appearance, and it will likely serve as a tribute to her body of work. Kathleen Kennedy had this to say in a statement this past week. Shortly after her passing, fans held a Lightsaber vigil for Carrie Fisher in Downtown Disney. Just one day after she died, Carrie Fisher's equally iconic mother, actress Debbie Reynolds, also passed away. A joint funeral and burial is being planned for the two, though no date is given. Son and bother Todd Fisher says that a fan memorial is being considered, but nothing concrete has been planned yet.